Blood Orange (Arancia Rossa) Brownies : Both in batter and glaze, blood oranges create a perfect fusion of citruses and brownies’ texture. Is it obvious, by the first glace I mean, to define blood orange base for these Blood Orange (Arancia Rossa) Brownies ? When squeezing them, juice was intensively red, really, but when combined all together with the rest of ingredients, it looked more like pale pink mixture so I added 4 drops of red food colour. Luckily, the taste is emphasized by the zest of three small blood oranges and the outcome is really amazing. The final touch done once the brownies were completely cool helped the creation; Barbie pink glaze made them attractive and inviting. Moist and orange tasting slices (the whole batch this time) were gone for two days. Usually, I bake half of batch of everything but this was an exemption to the rule. Now, few days after, I started to think about using simple orange coloured oranges for another trial batch to see the outcome; what I should be careful with is the amount of sugar. Blood oranges were very sweet and, perhaps, if your oranges are not that sugary add some more suiting your preferences. Have you ever attended oranges or grapes or olives harvest ? The days are hot, you pick the fruits, make the juices or store the fresh fruits to the basement, squeeze the grapes to make the vine, talk, laugh and eat, of course. Cover 7 x 7 inches pan with aluminium foil and lightly oil it. In medium sized bowl, combine butter, egg yolks, orange zest, orange juice, food colour, vanilla extract and orange extract. In medium sized bowl, whisk egg whites, sugar and a pinch of salt until stiff peaks form. Slowly add flour, baking powder and liquids mixture to egg whites and gently mix until even texture. Pour the mixture into the pan and bake for 20 minutes. In a small bowl, mix confectioners sugar and orange juice to get smooth glaze and cover it on the top of the brownies. Cut 16 squares and serve. 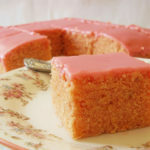 22 Responses to "Blood Orange (Arancia Rossa) Brownies"
I would love to attend a harvest of oranges, olives or grapes! 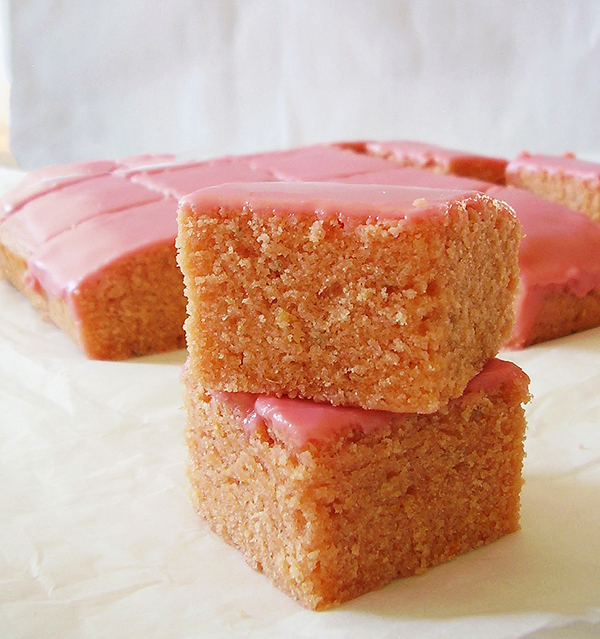 Your pinky brownies look fabulous. Oh it brings so much fun, you would enjoy, I am sure 🙂 Thank you for commenting ! What a creative and delicious recipe! I love the beautiful color and I can just imagine how fabulous these are! I’ll need to get these on the baking plan! These are really tasteful 🙂 Thank you for commenting Mary Ann ! What a stunning dessert! Of course, I adore all things citrus! Gorgeous brownies and so creative! When I think of brownies I think of chocolate so these are quite a treat. The color is amazing and lovely texture – light and moist. Hum…looks like I need to go find some blood oranges. So glad it’s citrus season. YAY! Hello MJ 🙂 So glad you love the idea. Thank you for commenting ! Citrus brownies!!! What a lovely texure and that melty glaze. Yum!! Never tried one of these before. I bet these are insanely delicious. What a wonderful flavor these must have! I love the floral sweetness that blood oranges have, and can only imagine how they taste! Thanks for a beautiful and fun recipe! Hello David ! Glad you love the composition 🙂 Thank you for commenting ! I have never seen a brownie with such as flavor. It is exciting! I gotta try these. I totally love that color! 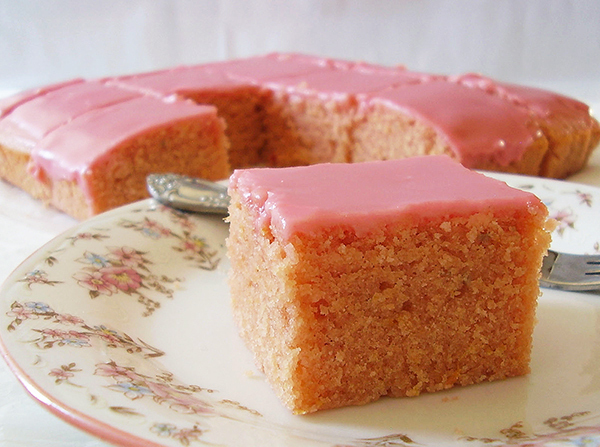 And the “Barbie-pink” icing? Sign me up! I’ve actually never had blood oranges, I need to go buy some! Thanks for the recipe! 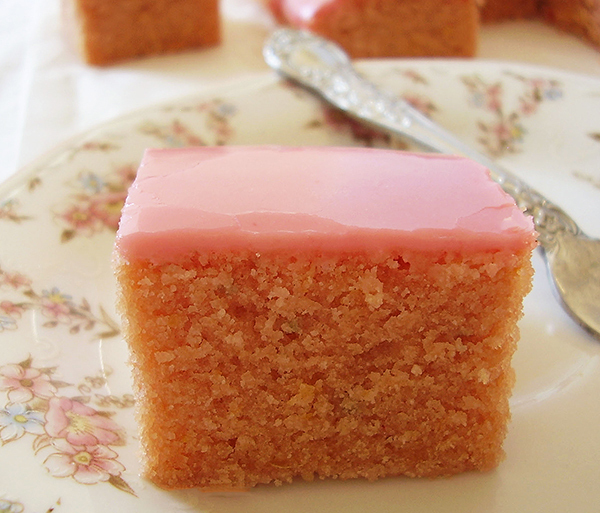 I love that colour, and these look SO moist. Perfect for this citrus season!! Oh yes; same weather over here. Citrus makes it easier to stand. Thank you for commenting !